Every city has its indigenous style of food. In Philadelphia you have the cheesesteak. Chicago is famous for deep dish pizza. 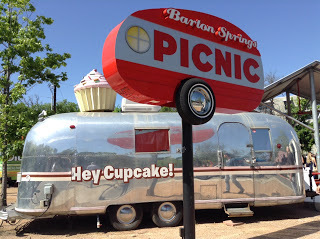 In Austin it's not the what is served (although Austin boasts establishments like Torchy's Tacos where President Obama recently made a pit stop), so much as how it's served which is in trailer courts--that will probably remind you of the way covered wagons used to huddle together around the campfire on westerns like Wagon Train. Picnic benches are set up in dirt and gravel lots that lie in the shadow of rentals, like The Coldwater, obviously named for another Austin institution, the spring fed Barton Springs Pool. The independent spirit of Texans and particularly Austin dwellers is often reflected on the advertising. Here are some sample inscriptions from one trailer: "It's been our pleasure to insult you," "Gluten allergies? Really? Cowboy up, you wussy." "We got the goods, we don't need to be nice." And here are some specialties from that self same traveling kitchen. The Shiner, the Lone Star BLT, the Spicy Southwest Reuben, the Texas Mesquite Turkey. The atmosphere is definitely put up or shut up, but you won't be disappointed. Even Cowgirls Get the Blues might or might not be the mantra for these hard working chefs.